Several factors affect the life of a tooth and, consequently, different causes can lead to dental wear. Unfortunately, their effects are cumulative and irreversible and, despite its main cause, tooth wear starts immediately after tooth eruption. 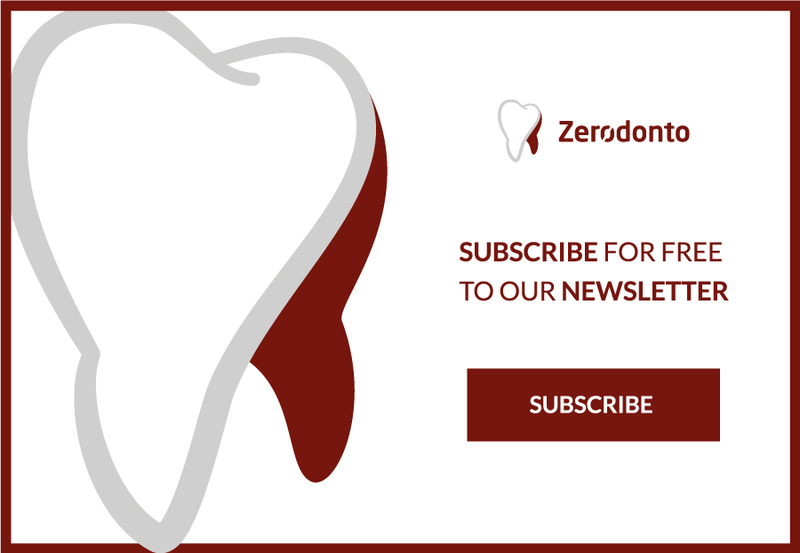 As a consequence, clinicians have to diagnose such a condition early, particularly when dental wear occurs suddenly and progressively in young patients. The processes causing tooth wear are attrition, erosion, abrasion, demastication, abfraction and non-carious cervical lesions. 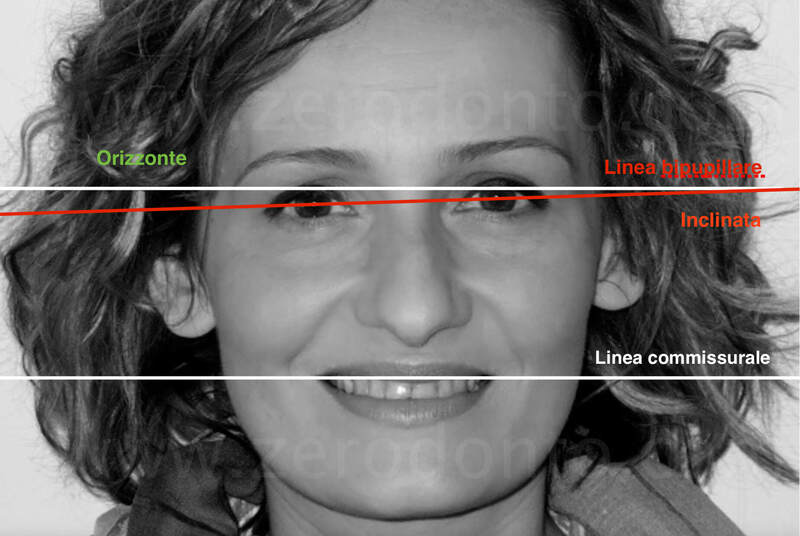 The horizontal line is used as the ideal reference line to set the facebow, independently from the parallelism with the bipupillary and commissural lines. 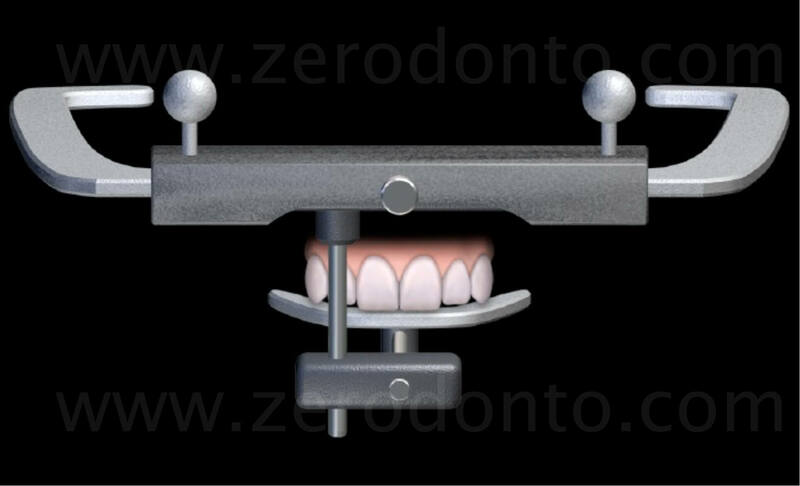 In fact, it is worth remembering that the condyles of the articulator are always positioned according to the horizontal plane. The progression of the smile shows that the incisal plane had a straight trend, with an evident reduction of the length of the anterior teeth. 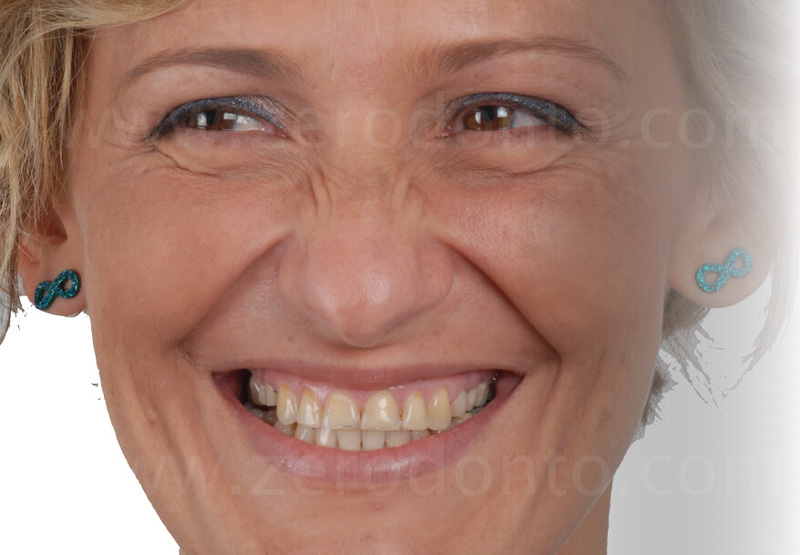 The picture at rest position allows to notice the visibility mostly of the mandibular front teeth, resulting in an aged appearance. No upper incisors are shown. The front view of the anterior teeth shows the shortening of the elements of the anterior maxillary area, due to severe wear, particularly at the level of the incisal margins; this was directly related to the serious wear evident at the palatal arch, secondary to the chemical erosion emerged during youth. The patient presented with the absence of the occlusal contacts in the posterior regions, due to the loss of retention of the previous temporary restorations. It is worth noticing how the shortening of the anterior teeth caused a marked reduction of the overbite. 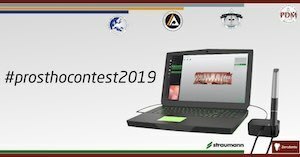 The occlusal view of the maxillary arch shows the evidences of recent surgical procedures at level of the premolars performed in another dental office, as well as the interim characteristics of the prosthetic restorations. Moreover, the severe wear of the palatal surfaces of the maxillary incisors is evident. A careful examination points out the severe wear of the palatal surfaces of the maxillary incisors, due to the chemical erosion caused by bulimia during youth. These specific areas are particularly subjected to wear phenomena because of the stagnation of acid remnants on the surface of the tongue, acting as “reservoir” after GERD events. However, it is possible to highlight the presence of peripheral marginal enamel similar to that resulting from a chamfer tooth preparation, naturally determined by the above mentioned acid action. Furthermore, enamel “islands” are present, and keeping them would be paramount to achieve a better adhesion of the final restorations. Although not in ideal conditions, the mandibular arch was considered acceptable both from the functional and esthetical point of view. 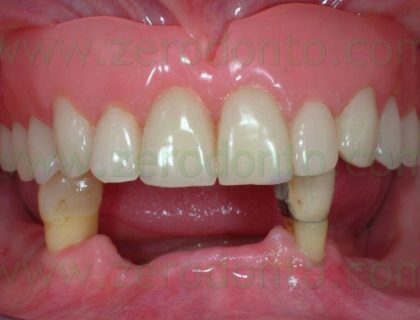 Asking the patient to make protrusive and lateral movements, it was possible to notice how the shortening of the maxillary incisors significantly affected the function and strongly limited the esthetics. As regards the phonetic analysis, the pronunciation of the “S” sound showed a marked horizontal movement of the mandible (3-4 mm), as well as a close adjacency of the incisors that reached an edge-to-edge position, however without getting any contact. The absence of a stable occlusal relationship in the posterior regions caused an easy movement of the mandible frontward. In the maximum intercuspation position (MIP), the patient almost reached the edge-to-edge bite position. Guiding the mandible in the centric relation (CR) position, the occlusal relationship between the anterior teeth significantly improved thanks to the automatic creation of the previously missing overjet. The occlusal registration between the posterior teeth comprises the increase of the vertical dimension (1.5 mm anteriorly) and the positioning of the mandible in centric relation (C.R.). Furthermore, thanks to the proper registration of the facial bow, it will be possible to restore correct occlusal relationships, particularly increasing the overjet in the anterior area. Conversely, the reduction of the overbite will be compensated by the lengthening of the maxillary incisors. 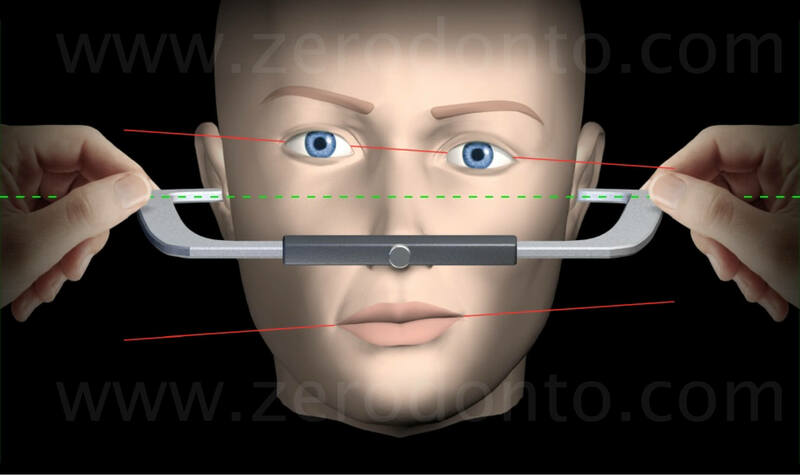 On the basis of the indications given by the clinician about the modifications of the maxillary-mandibular relationship, position of teeth and variation of the vertical dimension, the dental technician will make a diagnostic wax-up representing the expression of the occlusal-esthetical treatment plan performed by the prosthodontist. 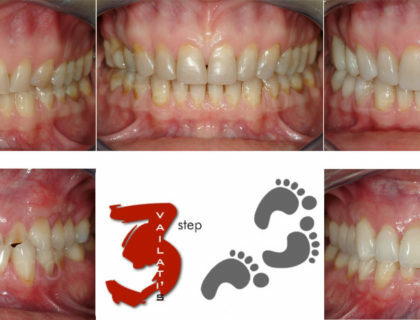 In order to achieve contacts with opposing teeth, the wax-up is extended on the palatal area of the upper anteriors, filling the room created by the increase of the vertical dimension. 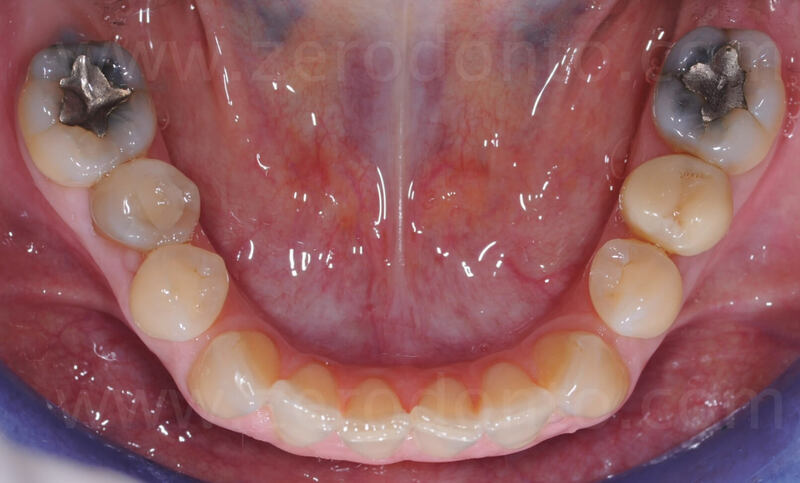 Such space will allow the clinician not to prepare the severely worn palatal surfaces. 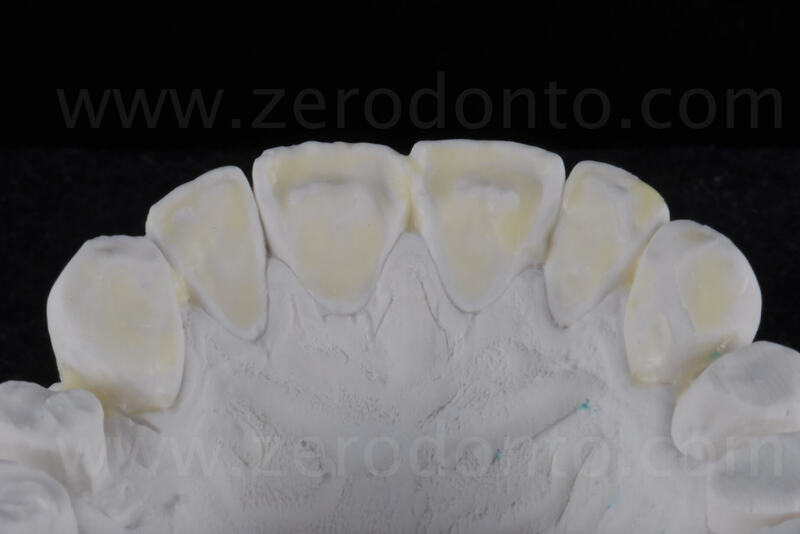 A silicone template is fabricated on the basis of the diagnostic wax-up and a flowable resin composite material is injected inside it. 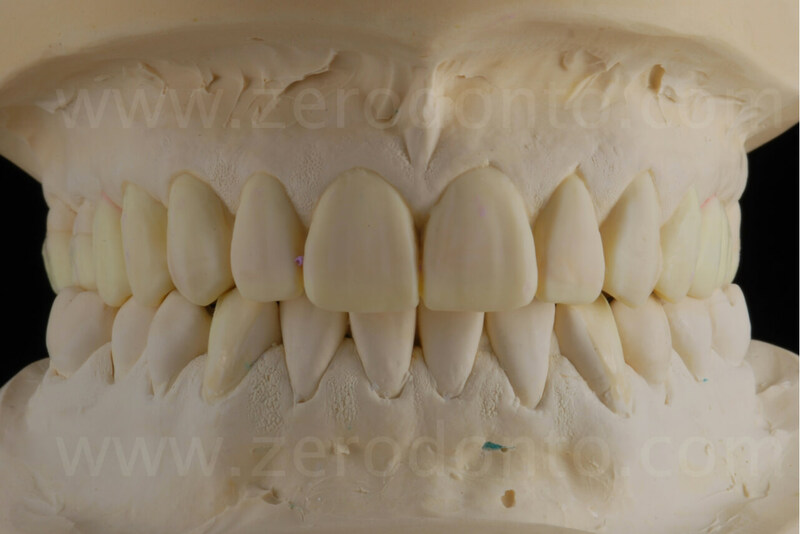 Then, the template is placed intraorally, letting the composite material to polymerize completely, so to assess the new position of the incisal margins and the correctness of teeth length. 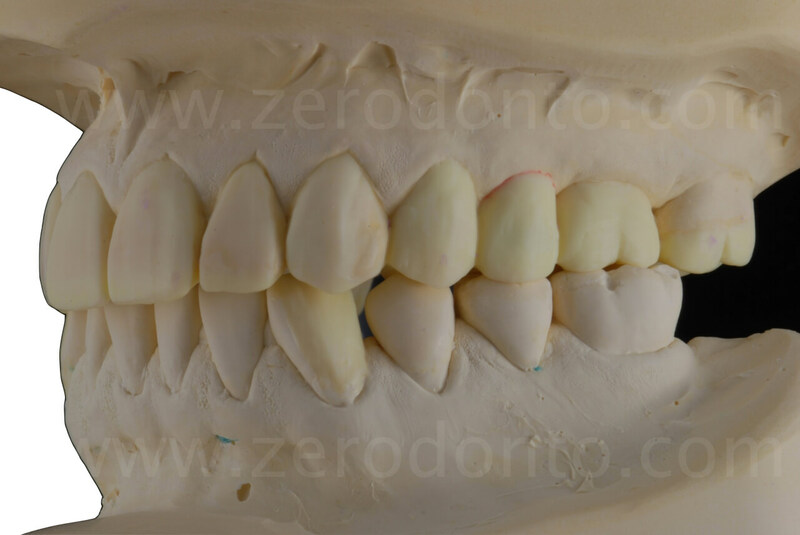 Thanks to this additive technique (mock-up), the patient will able to visualize the result achievable with final restorations, with no preparation of the underlying teeth. The modification of the incisal line satisfies entirely the patient, that now is able to recognize the length of her original teeth. 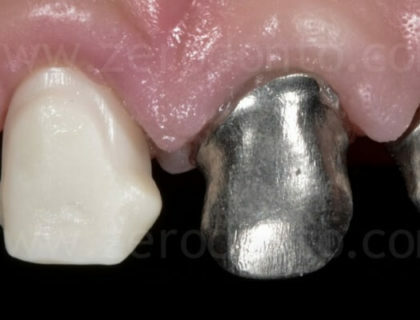 It is worth noticing that such technique, fully additive, allows the patient to decide comfortably whether or not to go on with the restorative treatment, as it is a reversible procedure. 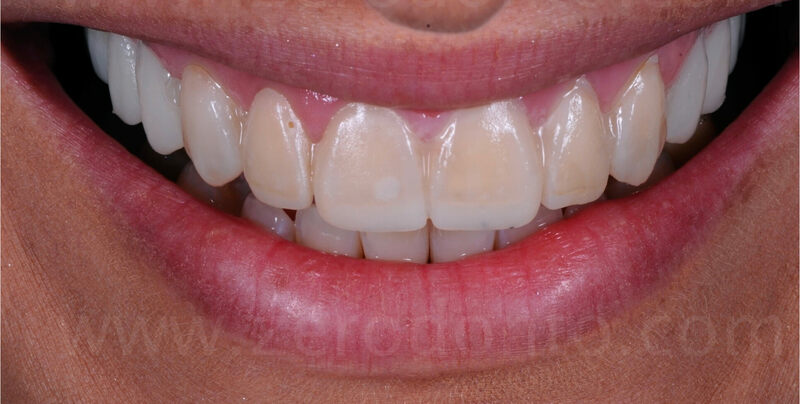 Even in the image at rest, a remarkable esthetic improvement is evident, due to the presence of the margins of the central incisors, perceived as a general rejuvenation. 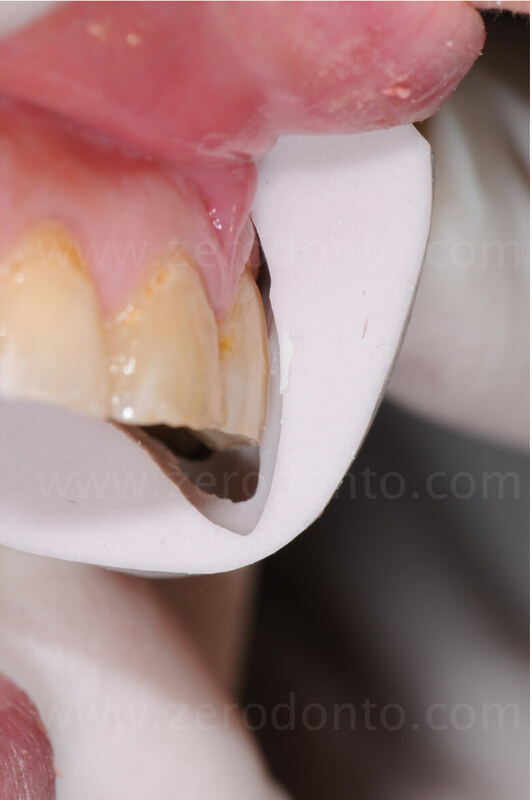 Partial preparations are performed in the posterior regions; thanks to the room gained by the increase of the vertical dimension, a great amount of enamel is preserved, ideal to achieve the best adhesion of the final restorations. The restorations positioned on the master cast, and after the adhesive cementation in the oral cavity. The finish lines on the maxillary molars are clearly supra-gingival. Thanks to these 8 posterior restorations at the maxillary arch, the occlusal stability is obtained in centric relation (C.R.) at the new vertical dimension of occlusion (V.D.O.). 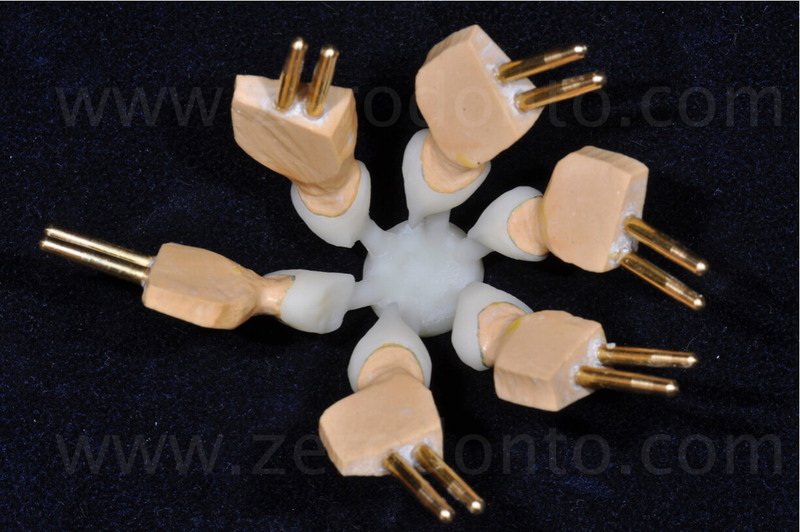 The increase of the vertical dimension allowed to achieve enough room to make adhesively luted posterior restorations. Thanks to the combined modification of the height variation between the dental arches and the positioning of the mandible in centric relation, it was not necessary to prepare at all the palatal surfaces of the maxillary incisors. 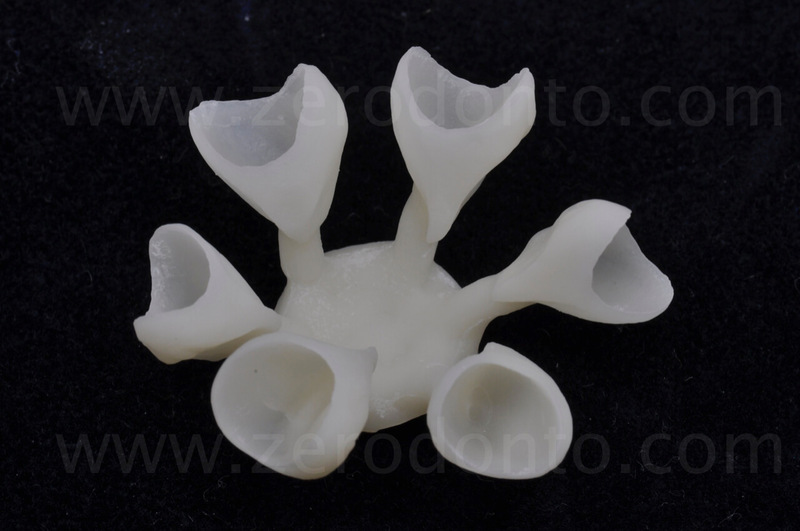 Dental preparations for full veneers were made in anterior sectors, using the silicone templates reproducing precisely the shape of the mock-up. The wide room available at the level of the incisal margins and palatal surfaces avoided the need for any kind of preparation in these specific areas, so despite the crown extension design these restorations are to be considered as a concept of veneer extension (full veneers). The difference between the original lengths and those reproduced in the silicone template highlight the desired lengthening, previously visualized by means of the mock-up. Once the mock-up was set, calibrated burs were used to perform the tooth preparations, whose design was in accordance with the newly established prosthetic volumes. 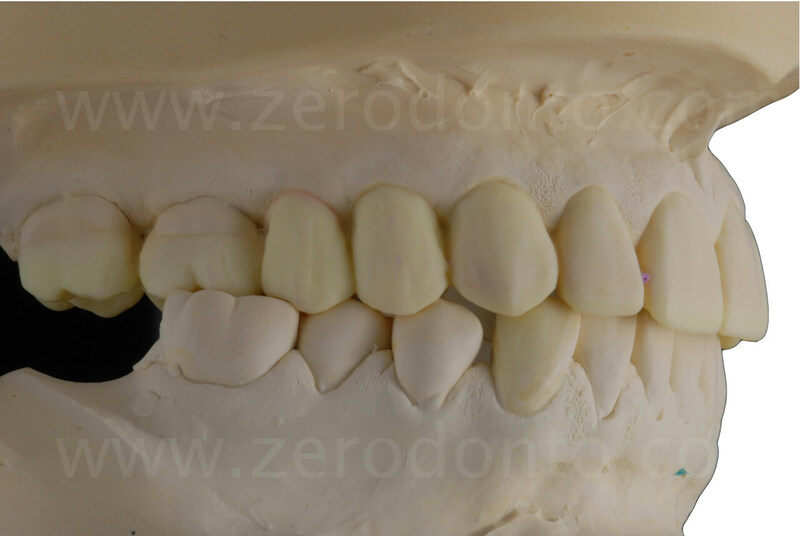 The increase of volume estimated with the mock-up points out how the tooth preparations minimally affected the underlying dental tissues, so as to keep as much enamel as possible in the final preparations. The tooth preparations were made with a very slight marginal chamfer and were entirely maintained in enamel. The positioning of retraction cords in the gingival sulcus will allow to hide the cervical margin of the restorations, optimizing the esthetic appearance. 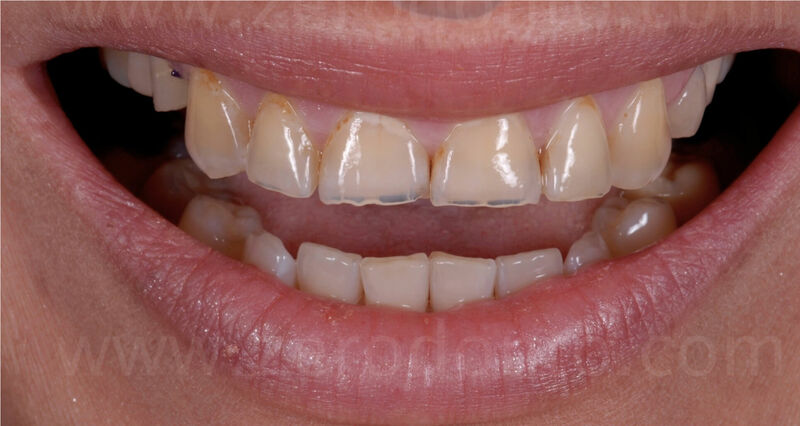 The temporary restorations were relined and finished, resulting in pleasant esthetics and optimal functional integration, thanks to the restoration of a correct anterior guidance. 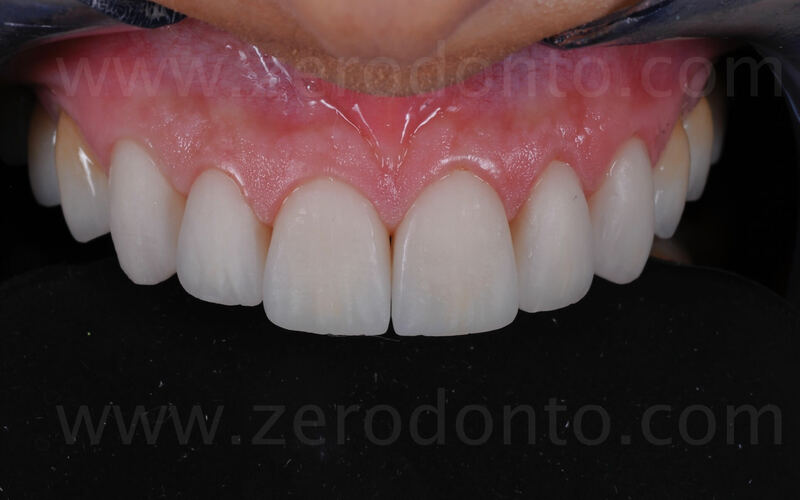 Then, 6 lithium disilicate anterior full-veneers were pressed, achieving good marginal fit. 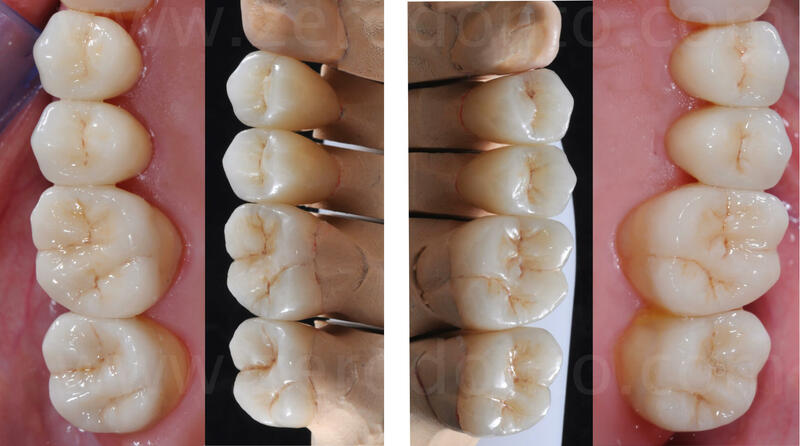 The 6 full-veneers were then stratified on the buccal surfaces, in order to optimize the esthetics. 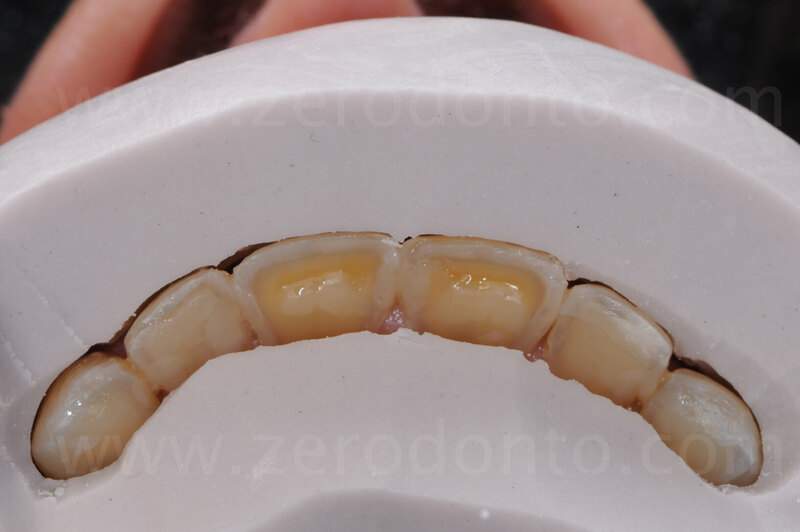 After about 1 month, the interim restorations were removed, in order to try-in the first firing of the final full veneers. 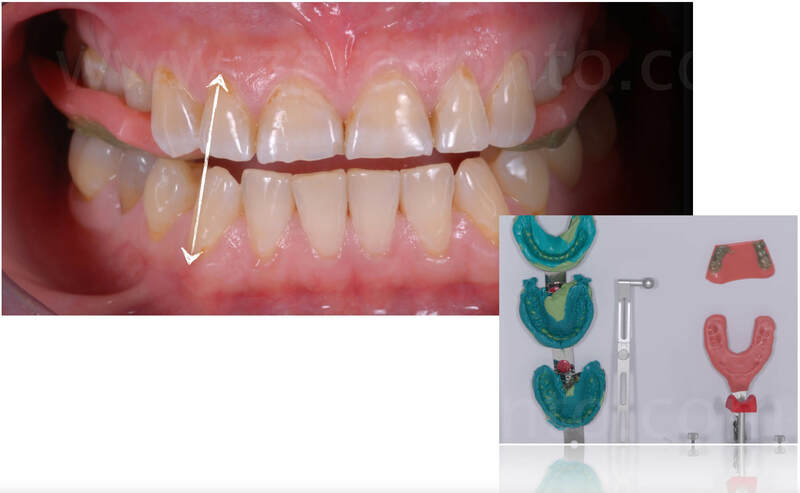 Thanks to the good integration of the temporary restorations, an excellent biological adaptation of the gingival tissues was noticed and the gums were ready to receive the final prosthesis. 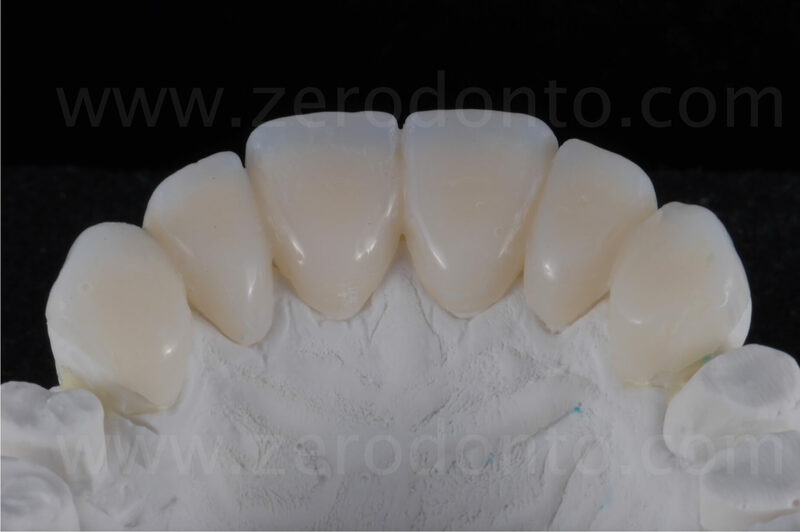 The inter-proximal contact points were checked, as well as the color and shape of the final restorations. Once placed in the oral cavity, the full veneers were slightly adapted and customized on the basis of objective data obtained from the esthetic and functional analyses and according to the specific demands of the patient. Finally, the color was checked and it was assessed if the chromatic changes could be limited to the application of color modifiers or if a further veneering by the dental technician was necessary. 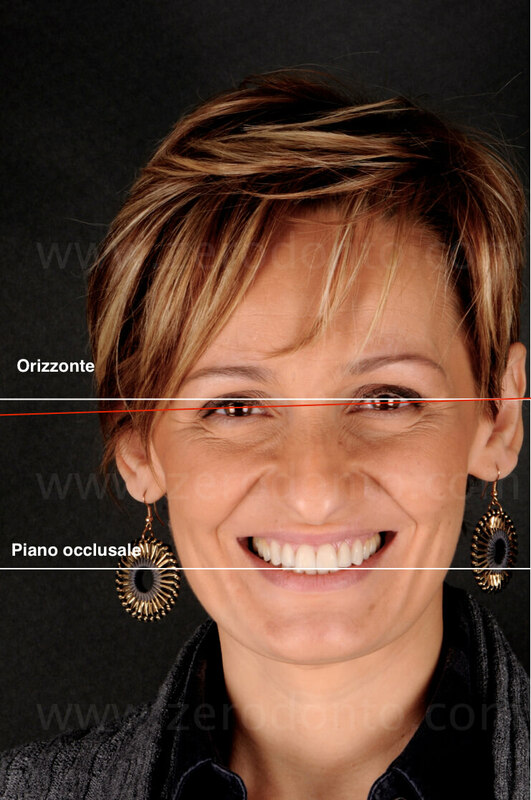 Moreover, during the ceramic try-in, the parallelism between the occlusal plane and the horizon was checked, taken as ideal reference line on the basis of the patient’s posture. Consequently, the bipupillary line was not followed, seeing as it was slightly inclined on the right side. The etching with 37% phosphoric acid shows the presence of enamel on the cervical margins together with a few enamel islands in the palatal concavities. 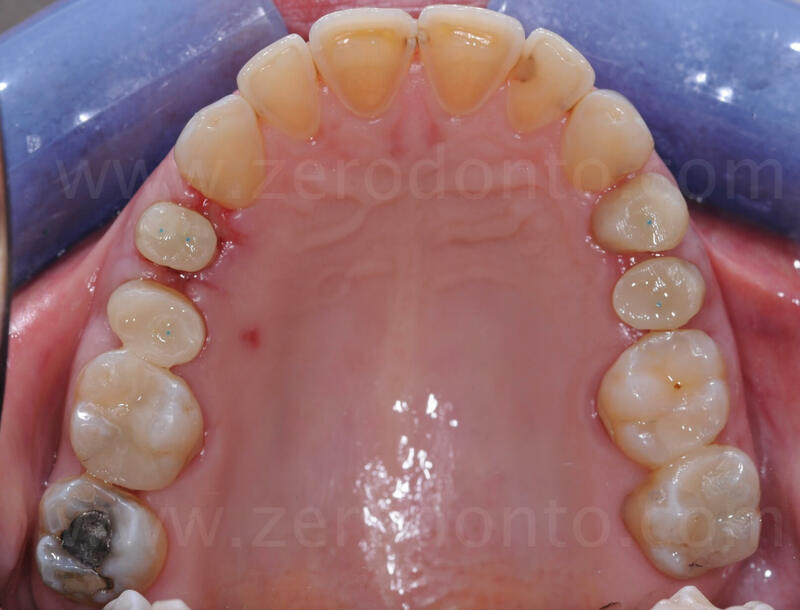 The front view of the abutments show the presence of enamel on all the buccal surfaces. The positioning of a retraction cord in the gingival sulcus allows to minimize the presence of crevicular fluid. At the same time, this represents an effective barrier to the penetration of cement remnants in the sulcus. 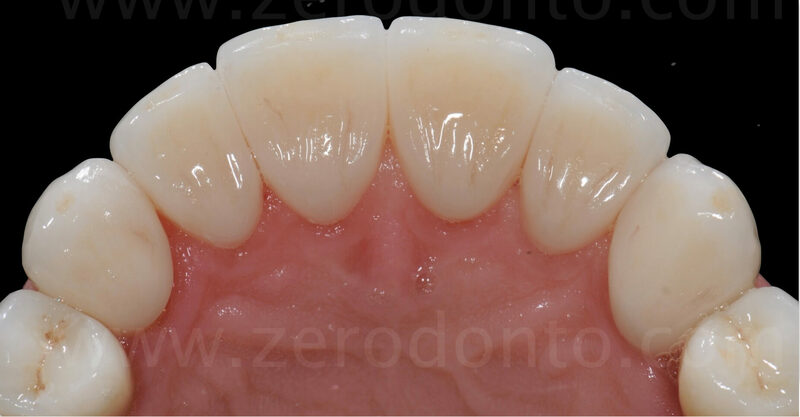 The anterior palatal areas before and after the substitution of the interproximal composite restorations. It is worth noticing how the tooth preparations did not affect the palatal surfaces, not even touched by the burs. 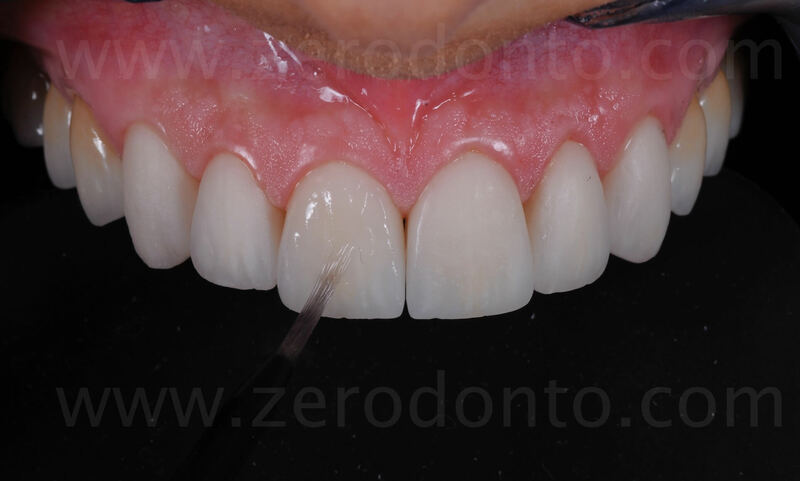 The anterior palatal area after the positioning of the restorations; in this area, the full veneers have an average thickness of 1.5 mm, equal to the increase of the vertical dimension. The occlusal view before and after the adhesive cementation of the lithium disilicate restorations. Both the incisal and canine guidances were replaced, so restoring a correct function that had been lost before the intervention. 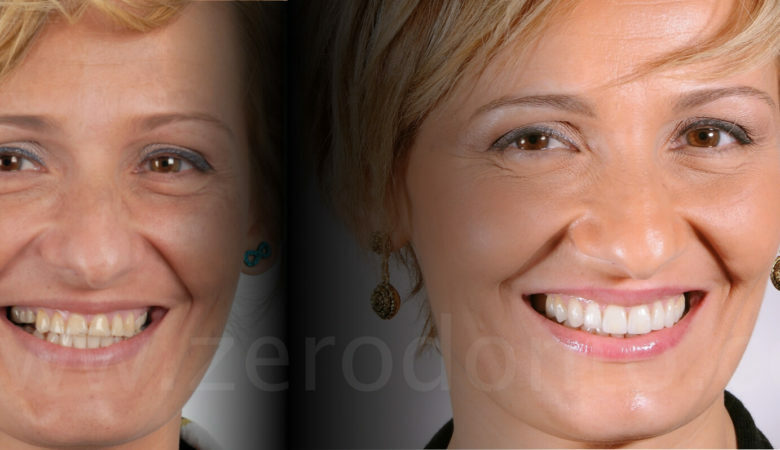 The view of the smile with the final restorations entirely satisfies the patient. The comparison between the mandibular movements before and after the prosthetic rehabilitation shows the obtained neuro-muscular adaptation (horizontal vs vertical dynamics), that allows the patient not to put the teeth in contact during the pronunciation of the “S” sound despite the significant lengthening of the upper anterior teeth. 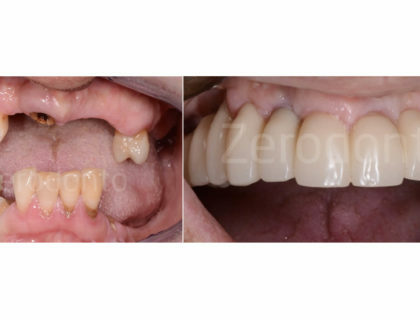 In fact, the patient showed a remarkable horizontal path (3-4 mm) before the placement of the temporary restorations, that had to be carefully considered before modifying the anterior tooth length. After a few weeks, it was noticed how the movement became completely vertical, avoiding any kind of anterior teeth proximity, so proving an excellent neuro-muscular adaptation. 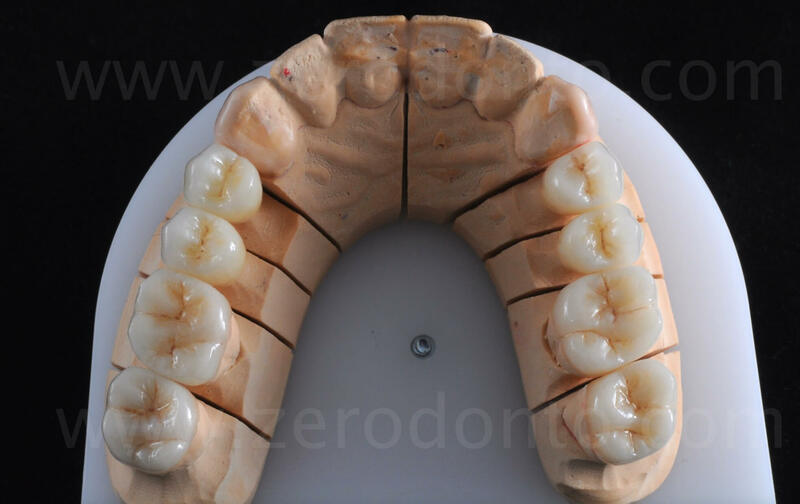 The view of the maxillary arch with the final restorations shows an excellent esthetical and biological integration. 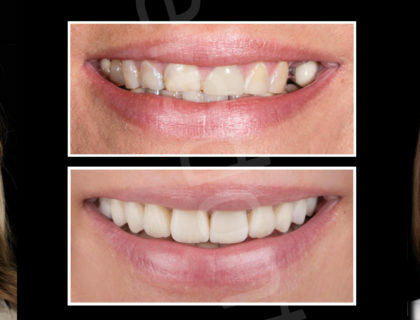 The patient was fully satisfied with the achieved result, that gave her the pleasure to smile again. The view of the final rehabilitation in comparison with the preoperative situation allows us to notice the obtained rejuvenation, restoring the patient’s self-confidence. 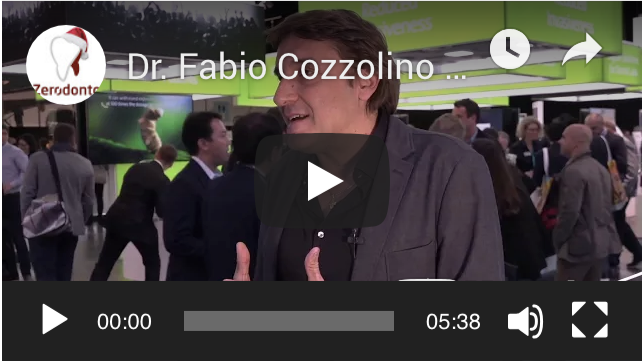 After graduating in medecine and surgery in 1979, Mauro Fradeani completed a specialization in dentistry at the University of Ancona, Italy in 1983. Past President of EAED – European Academy of Esthetic Dentistry (biennial 2003/2004) and Past President of AIOP – Accademia Italiana di Odontoiatria Protesica (biennial 1999/2000), he has served as Visiting Associate Professor in Prosthetics at Louisiana State University – New Orleans (USA) from 1999 until 2008. Active Member of The American Academy of Esthetic Dentistry, he maintains membership in The American Academy of Fixed Prosthodontics. He is Founder and Director of ACE Institute, Advanced Continuing Education centre in Pesaro, Italy. 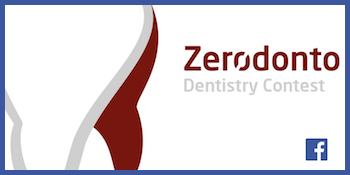 Associate Editor of The European Journal of Esthetic Dentistry (EJED), Member of the Editorial Board of Practical Periodontics & Aesthetic Dentistry (PPAD) and of the Journal of Esthetic and Restorative Dentistry (JERD). He is the author of the book “Esthetic Rehabilitation in Fixed Prosthodontics” edited by Quintessence International: Vol 1 “Esthetic Analysis translated into 11 languages and Vol 2 “Prosthetic treatment: a systematic approach to esthetic, biologic and functional integration” translated into 12 languages. He runs a private practice limited solely to prosthetics on natural dentition and on implants in Pesaro (Italy).For further info visit Dr. Mauro Fradeani website at: www.maurofradeani.it.